I hated the new town. I was 12 years old, and we had recently relocated, from Indiana to Pennsylvania. Middle school is a difficult time of life for most anyone. Starting middle school as the new kid in town is even more difficult. The calendar may have said the 1970's, but in DeMotte, Indiana, it was still the 1950's. Or maybe the 1850's. Stores, and even the town's lone restaurant, all closed for Sunday. Schools held no activities on Thursday nights because that was when churches had midweek services. And speaking of the schools, a nativity scene decorated the school office area every December, and the principal took it to each classroom to explain its significance to the Christmas holiday. That was in the public school. Central Pennsylvania was a world away--a tougher, more secular place where few of my classmates attended church. Awkward and lonely, I spent a good deal of my time playing my piano and listening to my dad's classical music collection. During that autumn, I developed a love for symphonic music and from there, the violin. 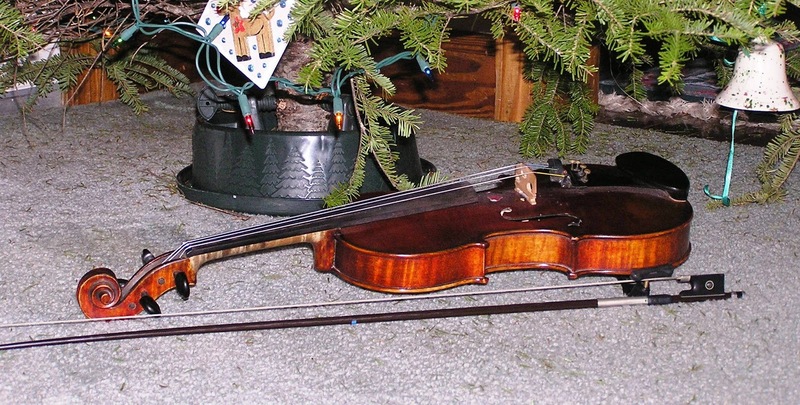 My most fervent Christmas wish was for a violin and lessons. To this day, I can still remember stroking the instrument's smooth maple on Christmas morning. I began lessons in January, and by summer, I had already practiced my way to simple Bach pieces. Minuet 2, for any of you Suzuki students (or parents). Then tragedy struck our family. In September, at the age of 40, my father died. Life changed, of course. We couldn't continue all our prior activities. Faced with a choice between violin and piano, I made the practical decision. The piano teacher lived closer to us, and since my school didn't have an orchestra, I had limited opportunities to play violin in a group. I continued studying piano through high school and college, and met my husband in the college choir. While I never possessed the talent to make a career in music, I put the piano lessons to good use playing for church services over the years. And so, the violin became just one dream exchanged for another. Then on a cold weekend in 1999, my life took another unexpected turn. My husband and I had buckled our two boys in the car and driven to the Philly suburbs for a Scottish and Irish music festival. Our oldest, not quite four, fell in love. In the months afterward, he pestered us continuously for fiddle lessons. Finally deciding he just might be serious, we found a nearby Suzuki violin teacher. Here he is, in 1999, at his first Christmas concert. As it turned out, Calvin was indeed serious. Now 16, he studies both classical violin and Celtic fiddle and has performed before tens of thousands of people. He has perfect pitch, an ability to improvise harmonies on the fly, and far more natural talent than I ever possessed. He plays by ear. He writes his own compositions. And he makes me proud. From a merry Christmas morning, to disappointment, and now to delight--my life has come full circle. These days, I get to listen to beautiful violin music, and I don't even have to go through the work of practicing! Did you ever exchange a dream for another one, only to have it turn out better than you ever anticipate? CJ, this is sweet and sad all at the same time. And awesome. How wonderful for your son. I wish him so much luck! Happy Boxing Day, CJ. This was great. It reminded me of your Author Memories post where you talked about Pappy's Fiddle and his musical legacy. But instead of concentrating on Pappy, this was about you and that made it special. I loved the Christmas tie-in. Thanks, Suzie. He's talking about perhaps a music minor or even a dual major of chemistry and music. A career in music is so difficult, and he is gifted in the math/science area. But the music would make a wonderful ministry -- he could be a great blessing to a small church that can't afford a paid music staff. That is an amazing story and I agree it seems like you got your dream and more when God gifted your son with such a desire. Some day I hope to hear him play but this story will stay with me always. Thanks so much, CJ. I'm sorry for the loss of your father at such a young age and certainly our heavenly father has purposed this talent in your son as a reminder of your dad's love for you as well. Anita, I realized it was similar to the other blog, but decided it would be okay since it has a different focus. I ended up with Pap's fiddle since (at the time) I was the only one who had expressed interest in learning to play. Dina, isn't it great when we can share an interest with our children? Of course, mine had to have gotten his interest in chemistry from somewhere other than me. Maybe his dad. Deb, what I've since found most amazing is that I never pushed him that direction. He made the decision to learn the violin completely on his own. When other parents would ask us how we got him to practice, we told them that we never "made" him practice. Those few times when he seemed to really not want to practice, we'd say, "Honey, you don't HAVE to take violin lessons. If you want to quit, that's fine. We'll take the violin back and you can do something else." I think we only had to say that twice, and both times the response was, "Don't take my violin!" LOL. True. I don't understand where middle child got his love of wrestling, mixed martial arts, and guns. Don't relate in the least. Of course, I'm sure hubby doesn't understand child #1's love of reading or child #3's love of writing. Thanks, DeAnna. Good Christmas, but son #2 and I seem to be coming down with colds. Ugh. Thanks, Faye. Hope your Christmas was merry.